Mount-Royal was shrouded in fog. A man contemplated a city he could hear but not see. Fog might have just become one of my favorite photography subject. Wish I could order it at will. 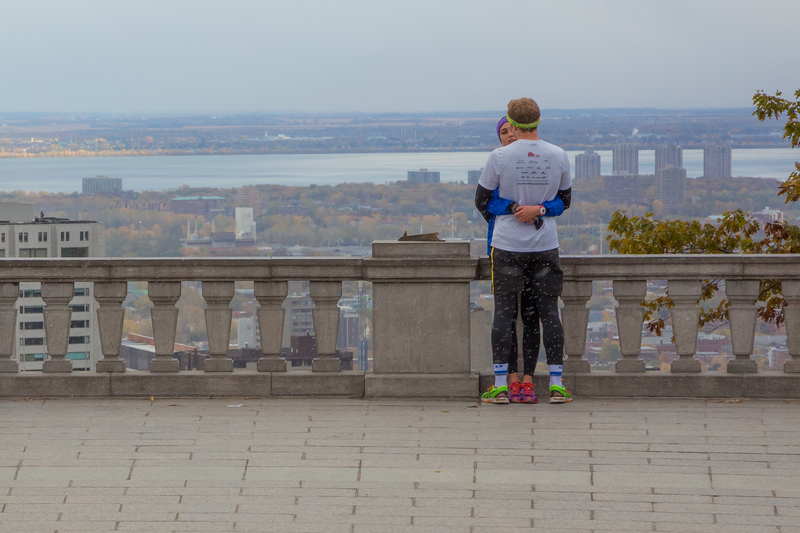 Early morning runner on Mont-Royal. One of the views you get when visiting “Le Chalet du Mon-Royal”. I think it was in 2000. My husband, two kids and I were visiting a friend, his son and daughter near San Francisco California. It was a beautiful day and our friend Steve suggested we go out for a walk. His children became very animated and suggested we walk up to the “Plus Sign”. I did not question it, but I was intrigued by the “Plus Sign”. What could it be? We walked up a hill for awhile and at the top, there was a cross. Steve’s kids had always called it the “Plus Sign”. Ever since, it stuck with me; a cross on a hill is now a “Plus Sign”. Some Montrealers might be insulted that I call Mont-Royal a hill. Here we fondly call it “The Mountain” but really folks, it’s a rather small one. So here, I present to you Montreal’s “Plus Sign” that sits on top of Mont-Royal.